Check-in – 3 to 9.30 p.m.
Breakfast – 8 to 10.30 a.m.
point for all the couples who wish to explore the area. The Corte dei Francesi is located in Maglie in the province of Lecce. Maglie is a small town of Apulia in the heart of the half island of Salento, in the heel of the Italian boot. 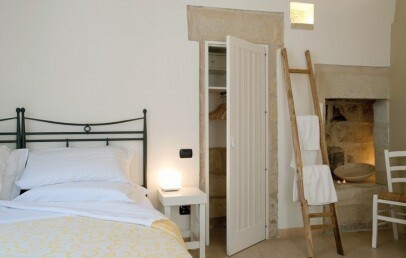 It lays at 17 km from the sea of Otranto and at 70 km from the airport of Brindisi. The Corte dei Francesi has been know in the territori of Maglie since 1832. The name comes from the brothers and masters of the tanning factory Lamarque. The history of the building takes us back to the 14th century. Nowadays, after long restoration works, the Corte dei Francesi has become a Bed & Breakfast of top category and a museum of the tanning. This classy hotel disposes of ten rooms and one suite. 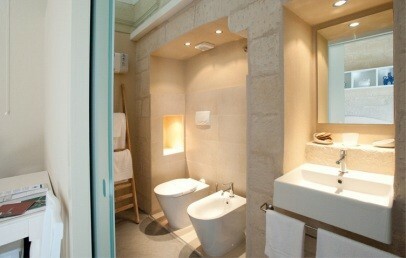 All rooms are with bathroom and are equipped with hairdryer, safe, internet connection, TV and air-conditioning. 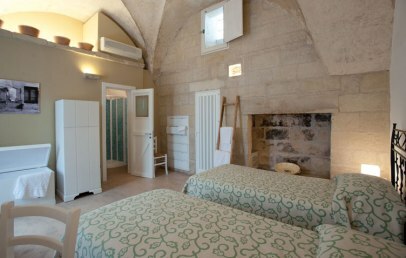 All rooms have access to the ancient court of the hotel. On request guests will be provided with the following services: covered parking space, laundry, babysitting, DVD player, car rental, boats and bikes rental, excursions and seaside lido reservations.